What's to say? 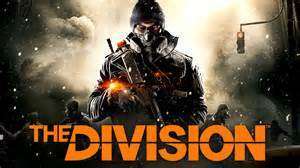 The Division has a free weekend this coming weekend to mark the drop of patch 1.8. 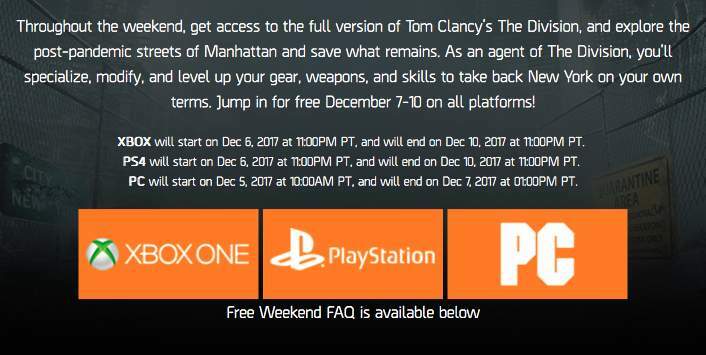 The free weekend will span across PC, Xbox One and PlayStation 4 and will kick off from the 7th December to the 10th. If you already own the full game ALL the DLC will be unlocked for your during the same time period. Throughout the weekend, get access to the full version of Tom Clancy’s The Division, and explore the post-pandemic streets of Manhattan and save what remains. As an agent of The Division, you’ll specialize, modify, and level up your gear, weapons, and skills to take back New York on your own terms. Jump in for free December 7-10 on all platforms! The timing suggests the Xbox One and PS4 weekend will kick off Thursday morning until Sunday, and the PC event 6pm tomorrow until Thursday (bit naff). It is a nice touch to give the DLC for free to those who already own the game. All I need now is the DLC to drop in price. A lot. Please stop liking this comment. It's blatant trolling. Love guns and loud sounds? Play this game. Infinite bullets. I got quite a few enjoyable hours out of the main game and daily challenges on this... until my friends diverged in the levels we were at. The best you can do on a game at too high a level is hide and going back to help out a lower level friend is just boring - why they never "normalised" the skills based on the group was beyond me. The Dark Zone is terrible - a huge amount of effort for very little gain... which promptly gets taken off you by the trolls that the game mode breeds. I might go back to sample the DLC (thanks) but I'm not at all bothered for additional Challenge Modes. The Ubisoft site is a bit confusing for me at the moment (late, no coffee) …The Ubisoft site is a bit confusing for me at the moment (late, no coffee) The timing suggests the Xbox One and PS4 weekend will kick off Thursday morning until Sunday, and the PC event 6pm tomorrow until Thursday (bit naff). Thanks for the heads up - I can see why you were confused, particularly for the days / times for PC players as the site contradicts itself. Looking forward to trying out Survival mode, though as for the "discounts" on the DLC and Season pass I expect they will be at exactly the same prices they have been on sale at the last half dozen times they have done it. Base game can be picked up very cheap from GAME / CEX and the like, but trying to add the season pass later - you might as well have bought the Gold Edition from the start. Heat!I got quite a few enjoyable hours out of the main game and daily …Heat!I got quite a few enjoyable hours out of the main game and daily challenges on this... until my friends diverged in the levels we were at.The best you can do on a game at too high a level is hide and going back to help out a lower level friend is just boring - why they never "normalised" the skills based on the group was beyond me.The Dark Zone is terrible - a huge amount of effort for very little gain... which promptly gets taken off you by the trolls that the game mode breeds.I might go back to sample the DLC (thanks) but I'm not at all bothered for additional Challenge Modes. Some fun to be had dinging rogues from distance with a sniper rifle, then having them try and hunt you down lol ... Take them on a preplanned route through the underground. Thanks for the heads up - I can see why you were confused, particularly …Thanks for the heads up - I can see why you were confused, particularly for the days / times for PC players as the site contradicts itself.Lets hope the times (for all platforms) are as they advertise this time round, as last time I went to try it on a Sunday evening to find the "free weekend" had already ended Looking forward to trying out Survival mode, though as for the "discounts" on the DLC and Season pass I expect they will be at exactly the same prices they have been on sale at the last half dozen times they have done it. Base game can be picked up very cheap from GAME / CEX and the like, but trying to add the season pass later - you might as well have bought the Gold Edition from the start. Survival mode brings out the best in the game. It's really good fun if you can get on with a group of friends. The end result is just more loot boxes but the actual gameplay getting to that point is fantastic. Dark Zone is amazing. Best game mode in any game bar Survival which is the height of tension the first few times you play it. But...it depends in your personality. If you like complete lawlessness and life not being fair, it is for you. If not - play another shooter. Dark Zone is amazing. 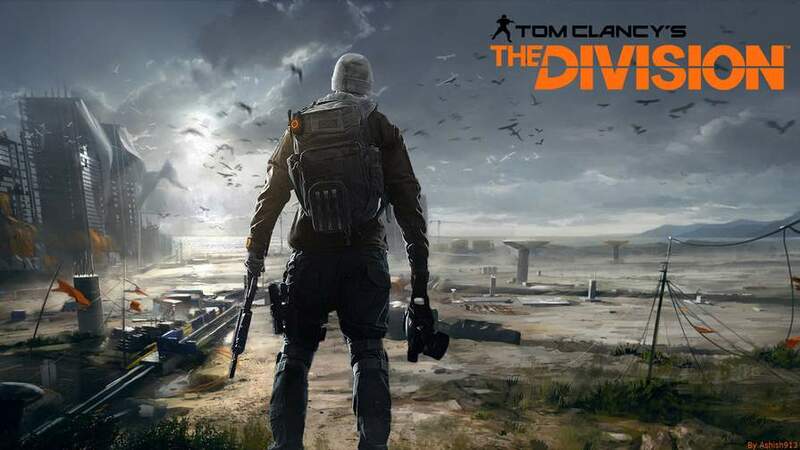 Best game mode in any game bar Survival which is …Dark Zone is amazing. Best game mode in any game bar Survival which is the height of tension the first few times you play it.But...it depends in your personality. If you like complete lawlessness and life not being fair, it is for you.If not - play another shooter. As coordinating friends on the same level as you is difficult, the Dark Zone and Challenge Modes have limited appeal and application. Is that all the DLC being unlocked for forever or just during the free weekend? Shame I don't have uPlay. Looks incredible on PC with the graphics turned up. Played the heck out of it on PS4 but tempted again after trying this.